You may have seen the fliers hanging all over Ashland… at least we hope you have! 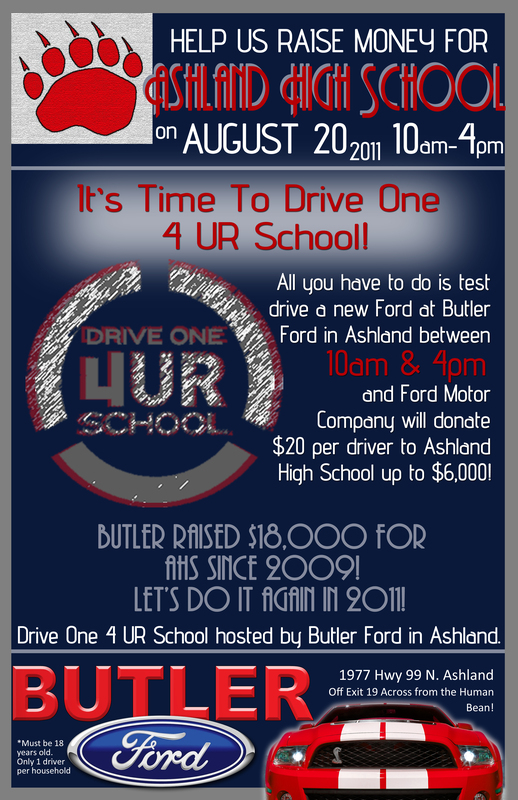 We’re doing our best to get the word out about our next Drive One 4 UR School event to be held at Butler Ford on Saturday, August 20th. All the monies raised that day will go to the Ashland High School Football Team. Anytime we hold a Drive One event we get excited but, this year, there’s even more reason to celebrate! Because our previous Drive One events have been so successful (we’ve held three for Ashland High, two for Phoenix High, and raised the maximum $6,000 nearly every time!) Ford Motor Company (FMC) is giving us the opportunity to bring in another $2,000, meaning we could be handing the Grizzlies an $8,000 check! and test drive one of our new Ford vehicles. FMC will give Ashland High $20 for every qualified test drive. Then, to earn the school an extra $10, all you need to do is take the 2012 Ford Focus for a spin. Viola! You’ll feel good for having made Ashland’s Football Program $30 richer, you’ll know more about Ford’s 2012 lineup of vehicles, and, thanks to the Grizzlie players, you can even get your car washed. All that, plus a BBQ! It’s a great way to spend an hour on a summer afternoon and, it’s for a good cause. time on August 20th to support our community and its kids. We pretty much guarantee you’ll get something out of it, too. See you there!